Abike accident can result in serious injury and damages, and therefore should be taken seriously too. A bicycle is considered a vehicle under the Ontario Highway Traffic Act (HTA). If you are cycling in Ontario, you have the same rights and responsibilities as those driving vehicles. Follow the rules – You have the same rights and duties as other vehicles on the road, and thus you have to follow the same traffic laws. Be Predictable – Use your hand signals, don’t swerve in-between vehicles, check blind spots, and always watch vehicles ahead of you. Stop – Most cyclists don’t stop at stop signs or traffic lights. Remain Aware – Anticipate the moves of drivers, vehicles, and pedestrians. Ride Ready – Just like any vehicle, maintenance is important for safety, check your bike over thoroughly once a week. Respect Cyclists – They are considered a vehicle using the road as much as you are, drive with tolerance. Obey Speed Limits – Driving too fast reduces your ability to react, speed limits are imposed to provide safety not only for yourself but also for pedestrians, cyclists, and everyone else. Stop – Come to a complete stop at stop signs and traffic lights. Remember that anticipating green lights is a chargeable offense and is very dangerous. Maintain Distance – Follow motorcycles and bike riders at a safe distance. Not only does this remove pressure off the person you are following, but it also gives you time to react should an accident occur. Pass – If you are trying to pass a cyclist exercise patience, execute the pass only once it is safe to do so. Additionally, all of these injuries listed above can also result in secondary issues, such as not being able to go to work, or having to pay for medical and rehabilitation costs related to your acquired injuries. 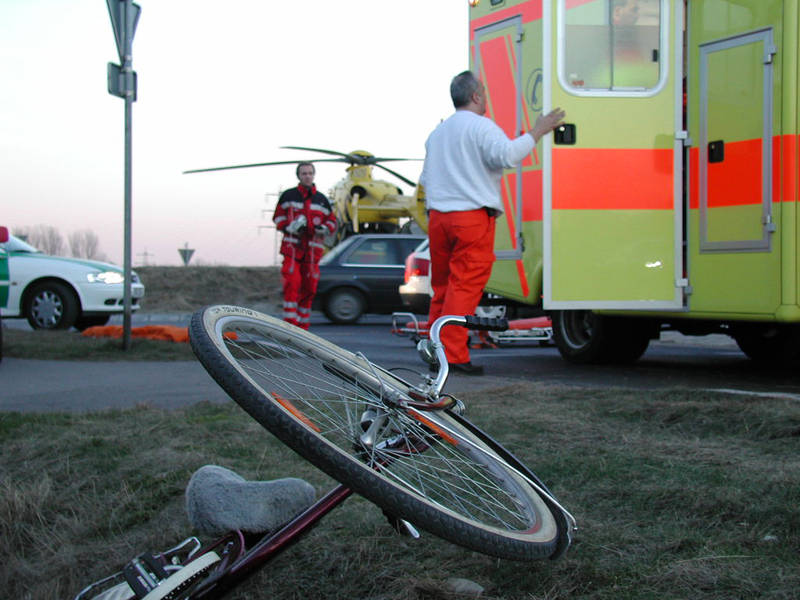 If you are hurt due to your bike accident, call 9-1-1 or have someone else call. If you do not need an ambulance, you should still contact the police. Any accidents that result in personal injury or damage over $1000, have to be reported. Sometimes the police will not come to a collision if the injuries or damage are not serious enough in car versus car collisions, however in the case of vehicle and bicycle accidents or vehicle and pedestrian accidents, they should attend. Get the driver’s information. Write down their name, address, phone number, driver’s licence number, vehicle licence number, and insurance information. Try to obtain the information of any witnesses. It’s best not to assume the police report will collect and record this information for you. As soon as possible write down everything you remember; the when, where, what, who, and how of it all. Weather and road conditions are another factor to record. Sketching the scene can be a useful way to quickly and accurately record the incident. If your helmet, clothes, bike or any other personal belongings are damaged in the bike accident. Keep them as is. Don’t have them mended or repaired until your lawyer says it’s okay. If you are injured in bike accident, you should see a doctor. This will give you the documented proof you may require later on to ensure you were in fact injured as a result of the collision. You should also take photos of your injuries as soon as possible, and make dated notes of how your injuries progress so that you can retrospectively provide a detailed log of the impact of your injuries. As a cyclist, you are considered an operator of a vehicle, therefore you are entitled to no-fault benefits if you are hit by a vehicle. If you happen to be a driver as well as a cyclist and have auto insurance, you can claim no-fault benefits through your insurer for any accidents that happen while cycling. If you don’t have auto insurance you can claim benefits through the insurance of the driver who you got in the collision with. The process for a bike accident insurance claim can be confusing, and it is generally advisable to speak with a lawyer before you contact any insurance companies. It is best to act within a week of the incident.